If you own a vape business and you want to sell your products in the UK, US, Europe or indeed anywhere in the World. Our Global Vape Shop Database of Leads could help you identify areas where the product is required to enable you to increase your sales. Having the product listed in the Uk Vape Shop Database could also help leverage your investment in vape business. It is true that having a beautiful website or a brand which few people have heard of will never grow your business. You need to work hard to ensure that your business brand is exposed to help increase your sales volume. Already, over 500 e-liquid shops have been listed in the Vape Store Database. It means that they already have an upper hand so allowing your business to be listed on Uk Vape Shop Database could help you expand your shop’s target audience. There are plenty of ways through which Vape Store Database can help you reach more potential customers. Some of them include using newsletters, Using Vape Store Email List, telemarketing and many more. It is another strategy that can help put your vape shop on the international market. 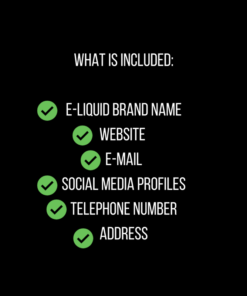 It will not only provide you with direct leads but other critical data from vape exhibitions. Also, it will ensure that your vape shop is actively featured and gives you an opportunity to reach to users who may be hundreds of miles away. Your vape business will also get a chance to be featured by more organized marketing agencies and allow you to expand your promotional channels. It will also help you access not just Uk Vape Shop Database but also a global database that will give your shop an international outlook. This will also help you get the right data and statistics to use in product promotion. The quality of data you get is critical and can really help you focus your marketing effort and move your business to the next level. vape store database Get all your vape business b2c and b2b leads right here with the most comprehensive vaping leads list on the Internet. Our vape leads are gathered manually with all the up to date vapouriser store businesses in Europe, UK, USA, Canada and the Rest of the World. Get our Global vape shop database Leads with over 50,000 Global Vaping business B2B Leads and Dominate the market! Our Vape store database is better than attending vaping exhibitions and throwing money at marketing is great if you have unfettered access to financial resources. The story for smaller players is usually different. Expect to spend at least $5k on a vape exhibition and tonnes more on marketing your vape brand with magazines and other media portals. Our global vape store database is simply the MOST AFFORDABLE solution. It is simply the BEST BUSINESS DECISION you will ever make. Our Vape store and shop leads are the best around, with the most up to date info on vaping stores available TODAY. Grab our vape store database today and we will show you how to dominate your market and win new business.